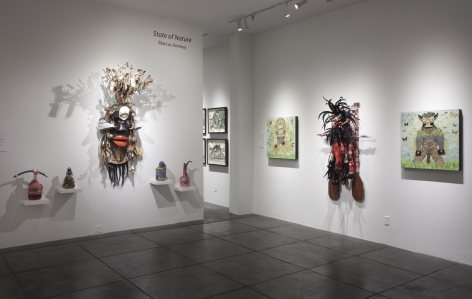 JONATHAN FERRARA GALLERY is proud to announce MARCUS KENNEY: State of Nature, New Mixed Media Sculpture and Collage. This is the first solo exhibition by newly-represented artist Marcus Kenney, who is well-known for his multi media collage works. The exhibition will run February 1 - March 17, 2012 with artist receptions on Friday, February 3rd and Saturday, March 3rd from 6-9pm. 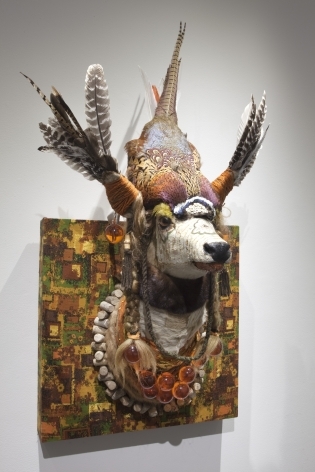 In his current body of work State of Nature, Kenney has expanded his assemblage practice to even more sculptural results. This body of work is a response to my growing interest in all things that have an indigenous quality to them. I am attracted to natural histories and native cultures and have molded this collection around that general idea. "State of Nature," according to the dictionary definition, is a term in political philosophy used in social contract theories to describe the hypothetical condition that preceded governments and what will happen when a government dissolves. Society would revert back to a "State of Nature" and become more tribal. With this body of work I imagine a postmodern society and the images and items found within it. 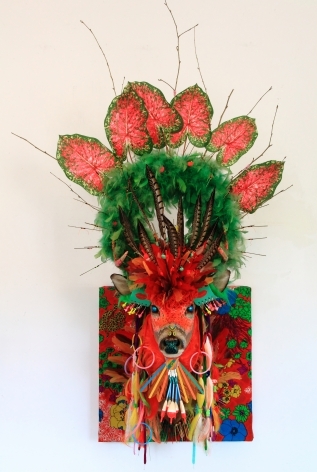 A tribe where animals become deities and leaders along side their human contemporaries. MARCUS KENNEY is widely recognized for his signature mixed-media pieces composed largely of found and appropriated materials. 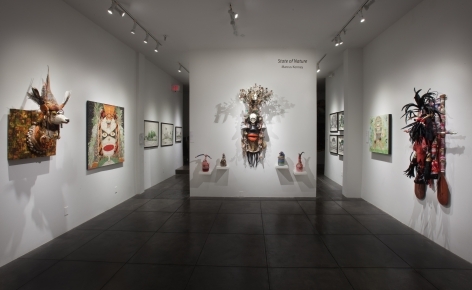 Kenney collects castoff items - old photographs, magazines and newspapers, paint-by-number works, wallpaper and other familiar objects - which he assembles into compelling, skillfully composed works of art. Marcus Kenney is a creator of provocative and often unsettling works of art. Originally from rural Louisiana, Marcus Kenney has lived in Savannah, GA for the last 15 years. He earned an MFA from the Savannah College of Art and Design in 1998. 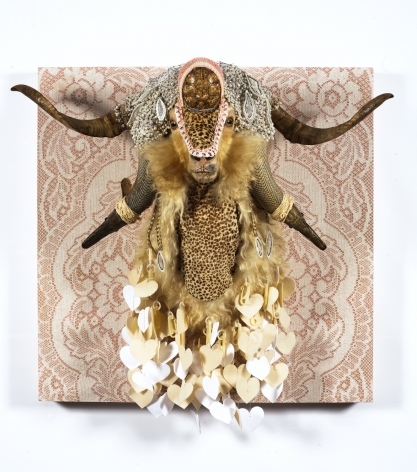 Kenney works in many mediums including collage, sculpture, paint, photography and installation. 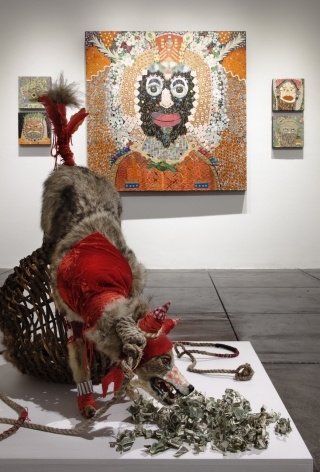 His work has been exhibited in New York, London, Miami, Chicago, Atlanta, Hong Kong, Paris, New Orleans, and St. Louis. 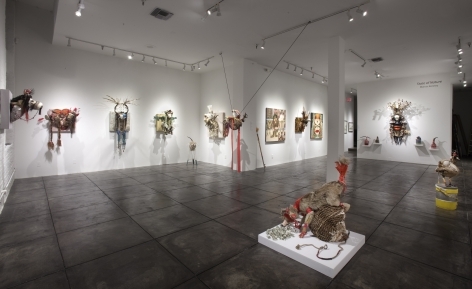 He has been included in numerous group shows, art fairs, and solo exhibitions including a major ten year survey featuring nearly 50 works at Jepson Center for the Arts, a collection of his work titled "Marcus Kenney" was subsequently published by SCAD. Marcus Kenney's work is in numerous private and public collections throughout the U.S. including Museum of Contemporary Art of GA, Atlanta, GA; Masur Museum of Art, Monroe, LA; Fidelity Investments, Boston, MA; College Of Charleston, Charleston, SC; Memorial Hospital, Savannah, GA; Savannah College Of Art and Design; Bank One, Monroe, LA; Jepson Center for the Arts, Savannah, GA; SABA Photos, New York, NY; Molloy College, New York, NY; Telfair Museum Of Art, Savannah, GA; King and Spalding, Atlanta, GA.
Kenney has been featured in numerous publications including Art in America, ArtPapers, The New York Times, South Magazine, Oxford American, ARTNews, The Boston Globe, Atlanta Journal Constitution and New York Arts Magazine. He has twice been featured in New American Paintings Southern Edition in 2004 and 2011.